Had an incredible amount of fun making Amit pronounce Mallu words like Padinyarattara, Chakkankulangara , etc. He basically wanted to know the name of each village as we passed along. It started with him trying to pronounce Pazhampori , the ubiquitous Mallu invention of frying sweet banana dipped in Maida in coconut oil. So we had a few Pazhamporis and teas on the way. I was beginning to feel my infection and kept myself hydrated throughout. Had a lot of fun with Deena and Pranav , we must have had 10-15 small hills (or more cross). At every downhill these guys would zoom past me, and I would wait for the next uphill to get my own back. Ended up forgetting my helmet at the lone pit stop today, and our official blogger fetched it for me. Halfway back to the hotel, Anjana made me wear her helmet for the rest of the journey. Can’t remember much of the night other than liking the calm night in Kalpetta. Had a severe case of congestion at night, and could hardly sleep, must have woken up about 8-10 times to use salt water to clear my nose and throat. (Naasyam). I am lucky that my room mates did not kill me that night. Today was the day TFN would live upto its promise of “Mostly Downhill”. About 140km or so of distance expected ,and we were going to enter God’s own country today.After the gift of Jace’s bike, felt more comfortable doing the misty downhills. My rides on the roadbike lasted a good half day , and now it was time to go back to hybrids. Duh, where is my helmet? It was drizzling and misty so the ride was delayed till the race director was comfortable. And as with any other day, 100 guys started off the starting block. We were made to cycle Ooty some 10 times before the route took us on the Gudalur downhill. There was some confusion so I just followed Prem. For the rain,I just wore 3 T shirts to ensure I was as dry as possible. Decided not to carry the rainjacket, knowing that I would be cycling in the Wayanad heat. Its great to get wet in the rain while cycling. We had a good break once we got out of the Ooty area. A tea stall selling Paruppu vadas and tea did roaring business from the descending cyclists. I am sure she must have done her daily quota in 2 hour of madness leaving some evening regular customers dissatisfied. Ram was also going to go downhill today after rehabilitating for a couple of days from his bruises. I learnt later on that he suffered another injury after slamming his chest after two buses forced him off the road. A crack on the ribs. The downhill was relatively quick , though I took a break at the tea stall(Ayyappa Enterprises)just before Naduvattam where I was greeted by Amit Chatterjee and co on the way up. Nice lemon tea, though the carrot stall opposite had not yet opened up. Went on downhill and took the designated detour towards Kalpetta from Gudalur. It was misty in the latter part of the downhill and some part of the road was quite wet. Our 1st pit stop was probably just before Gudalur at the same place which happenned to be the 1st pit stop on our way up. Wasn’t hungry but could not resist the temptation of a peanut butter and biscuit combo. And of course a customary swig of the pulpy orange juice. After going through the town, realzed how much of a shortcut we had taken because of the school. Soon after Gudalur, the scnery changed to large swathes of tea estates, and repeated stretches of horseshoe shaped roads with a tea estate in the middle. You could see the other side of the road sometimes even a kilometer away. I saw a lot of Moplah women on the way ,and stopped and chatted with one of them. She was curious about this steady stream of cyclists coming this way. I explained that we were on a tour of the Nilgiris and Kalpetta was our next stop. Was surprised to learn that I was still in Tamil Nadu though. This is one rather astounding feature of the state of TN. In the Border areas, you’ll find Kannada, Telugu and Malayalam (as I now learnt) spoken, but no Tamil. The areas surrounding Bangalore ,ie Hosur, Bagalur, Denkanikottai, Karadikal, etc, you would find a lot of Kannada and Telugu speaking people and here I found a lot of Mallus. I was determined to reach early enough to enjoy some time in the pool so I went ahead alone today, and in fact for the rest of the journey I was pretty much alone. The roadies had gone far ahead, and the other guys were enjoying the scenery. Somewhere along the road I overtook Mohan, Ross and her 9 year old son doing TFN. The next pit stop had some lunch, which I just took with me while I rode, since I was not hungry. The roads from Gudalur to Sultan Battery are long winding rods with huge tea estates, and you see a sea of tea estates everywhere you go. It surprised me as to how long the Kerala border took to arrive. We took a route that went near the Meenmutti waterfall. Given that it was 2km away from the main road with a rough approach (plus the fact that I was alone), I chugged along to Kalpetta. I was keen to use the pool today. Day 2 and Day 5,6 were the days we were in rather upscale resorts with nice pools. The opportunity to relax was welcome , but there was a time limit of 7pm for the pool usage. I reached the Kalpetta area sometime after 4 and was there at the resort before 5 pm. Today there weren’t much breaks apart from needed ones to replenish. I spent about 2 hours in the pool. I entered it soon after checking in, and was followed soon by Amit Mukherjee, Sudarshan Iyengar , Darshan and some more of the Pune gang. Got a little irritated that the hotel didn’t serve Mallu food. What is it with all these “resorts” that they serve Panner Butter Masala and Naan irrespective of their location. No local cuisine? One more reasons why homestays stand out. I cribbed to the hoteliers and they organized boiled rice from the food prepared for the staff. There was a display of all the photographs taken over the past few days at night, The day after was going to be a local Wayanad ride , but I was already feeling a little uneasy at the end of day 5. Cornered a bed on the floor ,away from the fan , as my repeated roomie Boni had a habit of sleeping with the fan on, irrespective of the temperature! We had the windows open, so that was not required, as Arun D’Silva also did not like the fan on, and actually it was a bit chilly. God knows when I must have drifted to sleep after the spirited night and the noise from the bonfire outside. My room mates Darshan, Yogesh and Gokul came in later at night. Gokul was my bed-mate and complained the next day that I pulled up more than my fair share of the comforter. Possible, I remember having a tug of war in my sleep, shivering in the Ooty cold at night. Got up at about 4 am or so (Amazing how easy it is to wake up when on holiday, I try to replicate that on a workday with no success). In any case, I got up, got ready to go out for a walk. The gate was closed with a sleeping sentry telling us ‘Saar this is ooty, nothing and no shop will be up now’ My reasoning of course told me, this is Tamil Nadu where buses ply all night. Just tell us the way to the bus stand, there will be at least one tea stall. At this point Vamsee joined me and we set out for a walk. It did not take long for us to come to a tea stall a short distance before the main square. The guy served some bun with tea, and in the early morning chill, that was heavenly. We took a walk around the race course , effectively circumnavigating 3 sides of a rectangle to get to the bus stand, and saw many more tea stalls there. Got back to YMCA and saw a bunch of runners (Jace, Chidambaram, Vinodh) getting ready for an early morning run in Ooty. Post breakfast, a big gang headed with Prem to tour some forest areas around the base of Doddabetta. Most of us went on an open tempo, and the journey must have been exciting, though I chilled next to the driver. During the walk in the forest, a forest ranger stopped us and asked for permissions. Prem and his local friend expressed surprise at the requirement, and went about furnishing their local credentials. The ranger relaxed and advised them to please come with permissions next time, because in his words, teenagers who frequent the areas on bikes don’t know how to behave in the forest, they create noise and throw junk around. We spotted a malabar squirrel on the way, a red mushroom which caught the fancy of cyclewallahs with photographic inclination, and general flora. Its amazing to walk on thick layers of leaves scattered on the forest floor. I cringe everytime I think about how little effort we make to preserve urban green spaces. A plan to climb Doddabetta through the woods was abandoned due to lack of time. We decided to head back to do the customary Chocolate shopping. Prem was showing around the area when Juggy mentioned that yeah we’ve been here before, we had the Ooty run on this spot where we are walking. He seemed very knowledgeable of the local terrain. Mayank was lagging behind photographing all the insects and mushrooms on the way. Once we reached the main road, it was mid afternoon. We reached a junction where there were jeeps willing to ferry us to town. The ride to town was in a closed jeep. After reaching the town, we went to have lunch at Kurinji, the cheese dosa was awesome. And of course we downed a truckload of chocolates while we kept waiting for the Dosa. The place was decidedly small but very good. After this we went to King’s for the chocolates and fudges. I must have spent close to a 1K there on chocolates and fudges. I also managed to find a shop that sold Long pepper and bought 1/2 a kg of that stuff as well. It was evening by the time we came back. Caught Kiran who told me that he was quitting TFN for a personal emergency, and I was free to ride his bike. Felt like a good option. 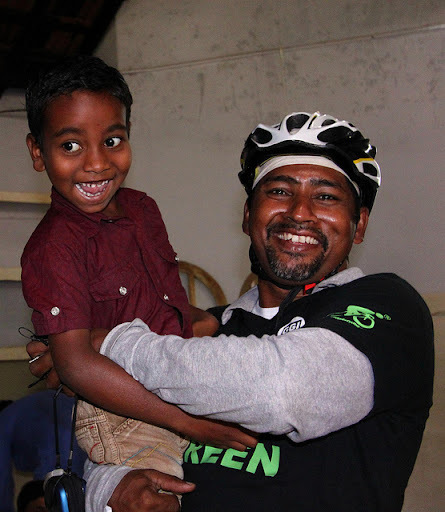 Rakesh Nair had a damaged bike and he wished to ride a road bike, and unfortunately the only road bike free was the Kruge. A lot of the folks were busy cleaning their bikes this day. Dinner was late in coming. Sudarshan Iyengar was busy playing old Hindi songs on the Piano, I could not resist joining him, and we were singing to some memorable tunes. Soon , a few folks started trickling in and we had our first Mehfil . This was probably the most memorable night in TFN, and it was made possible through Sudarshan playing around with the piano and me bursting in to sing a few songs.Haresh, the Pune gang, Priya , Anand all eventually made a big gathering and a big chorus accompanied by Sudarshan’s rendering on the piano. Overall I did not find Ooty too crowded or dirty despite the bad press I had heard about it. Probably because this was off season for Ooty. The marketplace was a little crowded but just about as much as say Munnar or Madikeri. Weatherwise, today night was much more pleasant (probably we got used to the cold). Most folks tucked in early and EOD happenned with looking forward to the (long) downhill on the next day morning. Day 3 was one of the most awaited days of TFN. Though mentally , it didn’t feel that tough. Overall we were going to do a distance of 87 km that seemed a little trivial compared to day1 and Day 2.Day started early in the morning. I got ready before the rest of my roommates woke up so. So got ready and went to the kitchen to have more than my fair share of the morning’s offerings. Last night it was the egg curry and morning it was the omelettes, the idli, chutney. Man I am beginning to love cycling tours. In any case, my excesses will be matched by the junta who subsist on protein shakes. So got ready and got out with my bunch of buddies riding in the jungle. All of us were stopped at the main road folks were being dispatched in groups of 5 to ride on the main highway passing through the forest. We had a 10 minute photo session with patrolman Gagan, and a few of us petered into the road. After about 10 minutes or so, shilpa started lagging behind us. I slowed down to stay back with her but I must have moved ahead. Santosh (tour direcor) told me about the lone lady tailing me. So I decided to move together with Shilpa till we scaled the next peak. There was a good chance that the twosome of us would look like a large group to a predator. Possibly would deter a predator looking to use the twosome of us as food for a couple of weeks. Along the way we heard that someone had spotted a leopard. Tough luck for us, it wasn’t one of us. After cycling for some distance with Shilpa , Priya caught up with us, so I decided to leave Shilpa with this group and pedalled forth. Caught up with Yogesh, Manju at the border with Mudumalai, where the river crosses under the road. While we were spending time in the company of our ancestors, Shilpa caught up. From this point on I rode with Prem Sagar, who kept a constant effort of educating me about every bird species we saw on the way. Unfortunately, my lack of birding skills means I’ve forgotten the names, though remember one with a long tail on the upper banks of the river. Eventually we crossed the forest and reached a tea shop a few km before Gudalur where a lady was waiting for us iwith instructions on getting to the tribal school (for which one of the riders, Sudarshan had raised cash). I now remembered this guy as one I had met in a ride around Sarjapur Road, and realized he was an avid runner. My gut feeling told me that the runners would easily ride ( I used to and still consider running extremely difficult – May be I am not professional about it but find it difficult to run more than a few km at a time consistently so have a lot of respect for all the marathoners and ultra-marathoners). So we reached the town of Gudalur. Supreet followed a small boy to the school and I followed him. The descent was quite steep and I was just wondering how the return journey would be like. The trip to the school itself was one of the highlights to the school. The kids were very lively, some lively songs and dance, I do hope someday they grow up to be successful people, making a difference in this world. I quite recall many of us giving speeches about verticals and “spaces”, wondered if the kids understood anything. Prem Sagar’s blog on this day covers the school trip very well, with a couple of videos to boot. Here is a link to it. The 3 of us reached the top, and I and SJ pretty much kept pace with Raghu who was on his bike. We reached SS1 after a while, and then realized that we are already on the Ooty road. (Was kind of an anticlimax,as I expected a steeper slope- in any case, after what we just came through, any slope could have not deterred us). From SS1 onwards I was pretty much alone but enjoyed the scenery thoroughly, with eucalyptus plantations and clicked a lizard on the way , and tried to capture a video of a malabar squirrel squeaking, captured the sound but the video was not clear. After SS2, at Naduvattam, my bike broke down , the rear hub cracked and my rear wheel was just basically came off , almost. Thankfully the station was 1/2 a km behind and the service jeep was near . My 2nd encounter with Jasvipul and company (Had caught him the previous day, when he had offered me handpump water) . Saravanan (the mechanic) said the bike could not be fixed, and I got to try out a BSA Kruge. Was a little apprehensive about trying a roadbike, took it and started, I increased the rear gears since the slope was easy, and when the time came to downshift, was quite confused not to find a 2nd lever. Just went back and caught the jeep coming up. Again Jas to the rescue. Apres la, went on , and must have caught up with Yogesh, Amit Mukherjee, Pramod , Visnhu at Ayyappa enterprises, the roadside tea stall. For the rest of the journey , I had a very relaxed ride, thanks to the roadbike. I could feel the complete lack of effort compared to my heavily armoured BTWin Triban Trail.There was some lake before we reached the town of Ooty. I expected Ooty to be really dirty but didn’t find it so. We all trudged into the YWCA for a heroes welcome, there was a welcoming party clapping on the final uphill into the entrance. Turned out there was no warm water in the evening and so a bath was out of the question. And in the cold, somehow you don’t smell the stink I guess. We had some sandwich and tea after arrival, the place was beautifully decked up for a Christmas party. The manager informed us that the different hotels have their parties on different days. Given that the day after was a rest day, there was a lot of spirits on offer from fellow members. One of them had got a single malt, and I ended up being the caretaker of it for the rest of the evening. The place was quite cold and the liquor warmth was quite welcome. The group of middle aged drunkards ( me included) were having a spirited discussion . And as with all such discucssions, I forget the topic, but remember that it was a high spirited discussion. While all of us were taking things in the right spirit, there was a talk by a pastor who had specifically for the party. No, he was not addressing the group in high spirits but there was a much bigger group of the devout and the respectful guests who had gathered around a bonfire-to-be in chairs specifically kept for the ocassion. While the pastor was talking about the festive spirit of Christmas, one gentleman from our group went on to demonstrate how to make a cocktail from vodka, and unfortunately might have drowned some part of the devout sermon. We were being frequently prodded by some of our less “spirited” friends to keep our levels of excitement (and more importantly decibel levels) down but I guess its kinda tough to come down when you are high. Finally when the pastor was talking about the holy spirit, somebody loudly drank to the holy spirit, me and my kindhost quitely slinked off down to the entrance, and I was clutching the single malt for dear life. Badri and company had come back with some warm fried Bajji’s. Nice accompaniment to the single malt. Once the excitement had died down, we came back, after observing that nobody was evicted. The rest of the night was largely peaceful . I noticed that more than half the bottle of single malt was empty, and I don’t remember too many people drinking it. My host affirmed that I had taken a lion’s share, though I was surprised I had drunk so much and was still in my senses. All this spirit meant that I went to sleep early , heard some noise outside but didn’t want to come from my bed. Had put on multiple layers of clothing and was feeling quite content in the bed. Tomorrow was rest day , and had decided to hang on to the local guide , Prem Sagar.